610 mm Triple3 х 3 pcs. 25 mm/60 Type96 mod. 12 х 1 pcs. Akatsuki — Japanese Tier VII destroyer. In many ways, Akatsuki is a side-grade from Fubuki. She is largely the same as her immediate predecessor, with a few minor improvements. Chief among these is a notable increase in her top speed. One of Fubuki’s more irksome negatives is her maximum speed of 35 knots; Akatsuki’s top speed bumps up to 38 knots. Her handling characteristics are almost the same as Fubuki as well, retaining her turning circle radius while losing time on rudder shift. Also improving is Akatsuki’s main battery. Though her guns are not her main damage dealer, she picks up two more barrels via an additional turret on the aft end of the ship. This makes her a more significant threat when she does decide to open up with her guns. The turrets themselves are the same as those on Fubuki, and they reload a little faster. Akatsuki’s primary armament is in the same configuration as Fubuki’s — three triple-tube torpedo launchers — while having access to slightly better torpedoes in terms of damage. Her detection radius is slightly higher than her immediate predecessor's as well, so captains will have to be a touch more cautious in their positioning when there are enemy gunboat destroyers — such as Mahan or Kiev — in the mix. She is as vulnerable to enemy aircraft as most other destroyers as well, so when and enemy carrier is present, cautious play is recommended. While Akatsuki is not a huge upgrade from Fubuki, the upgrades she does get are key to allowing her to remain competitive in her tier. Three triple-tube torpedo launchers give her enormous flexibility. Six main battery guns give Akatsuki a much nastier punch in gunfights than Fubuki. Good overall handling characteristics; veterans of Fubuki will feel comfortable maneuvering their new ship. Large detection radius is a significant handicap. Anti-aircraft suite is as weak as captains playing through the line have come to expect. Health pool is on the low end for Tier VII destroyers. Lacks access to the Torpedo Reload Booster ( ) consumable that Shiratsuyu gets. Akatsuki’s stock torpedoes are more than sufficient for her to work with initially; Hull (B) is the first recommended upgrade. Invest in the Torpedo module next, and grab the Fire Control System module last. Most of the upgrades Akatsuki captains will equip are pretty self-explanatory; there isn't a lot of variety available to significantly improve her performance. Slot 1 is best filled with Main Armaments Modification 1. Most captains will opt for Aiming Systems Modification 1 in Slot 3, but Main Battery Modification 2 is also a decent choice; when Main Battery Modification 2 is combined with Level 3 commander skill Basic Firing Training, the impact to Akatsuki’s reload time is negligible while the improvement to her turret rotation is notable. Propulsion Modification 1 is the number one pick for Slot 4 in order to protect Akatsuki’s mobility; Propulsion Modification 2 is recommended in Slot 4 for similar reasons. Commander skill points are best spent on Preventative Maintenance or Priority Target at Level 1 and Concealment Expert at Level 4. The tiers in between offer a variety of options for captains to choose from, allowing them to tailor their Akatsuki play in whichever way suits them best. Level 2's Torpedo Armament Expertise is always attractive to Japanese destroyer captains. Captains who fear having their engine disabled more will want to consider Last Stand instead. Expert Marksman also offers a significant buff to her turret rotation speed. Tough choices also abound at Level 3. Torpedo Acceleration is appealing, lowering her torpedo range to 8.0 km while increasing the top speed of her Type 90 torpedoes to 67 knots. This gives enemies approximately 0.7 seconds less of reaction time. Vigilance is also a good option, allowing Akatsuki captains to avoid enemy torpedoes easier themselves as well as spot them for teammates. Superintendent might also be a good pick for captains who don't wish to spend credits on premium consumables. Survivability Expert helps shore up one of Akatsuki’s bigger weaknesseses: her health pool. Demolition Expert helps make her main battery guns more effective at lighting enemy ships on fire. Level 4 doesn't offer Akatsuki much besides Concealment Expert, though Advanced Firing Training improves her main battery range and gives her a larger window from which she can fire her guns. Radio Position Finding is an intriguing skill that can help cunning players avoid enemy destroyers (or actively hunt them). Like all destroyers, Damage Control Party II ( ) is recommended in order to repair broken modules when under enemy fire. The premium version of Smoke Generator ( ) is also a good pick to ensure she can escape when needed. Engine Boost II ( ) likely isn't necessary. 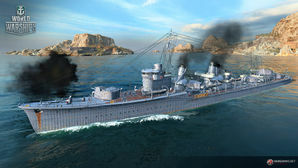 Players who wish to spend doubloons can equip Akatsuki with Type 17 camouflage that lowers her detection radius, reduces the accuracy of incoming shells, reduces her repair costs, and increases the amount of experience she earns. For players looking for a competitive playstyle, it is highly recommended to mount the following signals: Juliet Charlie, Sierra Mike, November Foxtrot, Victor Lima, India X-Ray, and Juliet Whiskey Unaone. Juliet Charlie protects the player from the increased potential detonation chances which India X-Ray and Juliet Whiskey Unaone give. In exchange, the two flags provide a potential increase in damage (+0.5% fire chance and +15% chance to causing flooding respectively). There is no need to worry about Victor Lima's debuff (+4% chance of getting flooding), as Akatsuki is a destroyer and will most likely not survive a torpedo strike. Sierra Mike provides Akatsuki a healthy boost to her speed (38 kts to 40 kts), and November Foxtrot provides that small but potentially life-saving decrease in cooldown timer for the mounted consumables. Players looking for a more relaxed play or simply grinding down the line are highly recommended to mount the following signals: Equal Speed Charlie London, Juliet Charlie, Sierra Mike, Zulu, November Foxtrot, and Zulu Hotel. Again, Equal Speed Charlie London will help speed up the player's XP grind and Zulu will help make a little extra credits for the player during the grind. Sierra Mike will give a more comfortable speed for players who wish to be able to cruise to their next target location during a battle. Juliet Charlie is optional for players who dislike being detonated. November Foxtrot is also optional, but if the player dislikes dealing with a disabled engine, rudder, or other vital module, then this can be coupled with premium Damage Control Party II for a more relaxing play. Zulu Hotel will increase commander training and retraining (if the player chose to use his captain from the preceding Tier VI destroyer Fubuki). Akatsuki fires torpedoes at incoming battleships. Akatsuki engages another enemy Akatsuki. Under enemy fire, Akatsuki attempts to dodge enemy torpedoes. Akatsuki fires at an enemy Atago from within her smokescreen. Akatsuki (暁 Dawn?) was the twenty-first Fubuki-class destroyer, or the lead ship of the Akatsuki class (if that sub-class is regarded as a separate class), built for the Imperial Japanese Navy in the inter-war period. Due to more efficient boilers, only 3, rather than 4, where installed, giving a distinctive look with a smaller round forefunnel. Subsequent Imperial Japanese Navy destroyers would later use 3 boilers for the same configuration of 2 steam turbines driving two shafts. When introduced into service, these ships were the most powerful destroyers in the world. They remained formidable weapons systems well into the Pacific War. The Akatsuki destroyers were a sub-class of the Special Type design so successful in the Fubukis. Four were built. DesDiv 6 (Akatsuki, Hibiki, Ikazuchi, Inazuma) All together at the beginning of the war, the destroyers of DesDiv 6 helped to cover the landings in Malaya and the Netherlands East Indies from December 1941 to April 1942. Returning to the Central Pacific, they joined the Aleutian diversionary force for the Battle of Midway in June 1942. After Midway, they were ordered to the South Pacific and participated in the Guadalcanal Campaign. Returning in 1943 to the Aleutians, the survivors of DesDiv 6 helped to evacuate Japanese forces there before serving as convoy escorts through 1944. Akatsuki was sunk by surface gunfire during the First Naval Battle of Guadalcanal on 15 December 1942. Hibiki survived the war and was awarded to the Soviet Union in 1947. Ikazuchi was torpedoed by submarine and sunk on 13 April 1944. Inazuma was torpedoed and sunk by submarine on 14 May 1944. 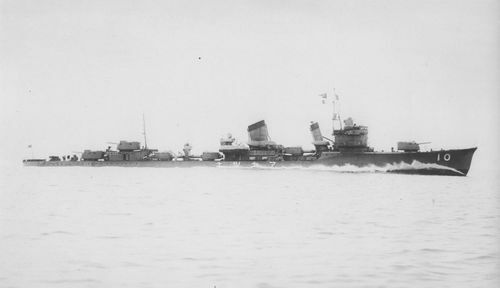 Inazuma underway on 24 March 1936. Akatsuki underway on 18 January 1937. Akatsuki steaming in the Yangtze River, China, while convoying transports in August 1937. Damage to Hibiki after being torpedoed by USS Hake on 5 September 1944. The explosion almost severed her bow. Photo taken in Takao (now Kaohsiung, Taiwan) on 6 October 1944. Hibiki after the conclusion of the war. She was awarded to the Soviet Union as a prize ship in 1947. This page was last modified on 13 September 2018, at 09:43. This page has been accessed 55,733 times.